Texas Select Vapor recently announced their new E-Liquid Tracking System, NicTrace. The new e-liquid tracking system allows the consumer to download and view the documentation of nicotine that has gone into your e-liquid product when purchasing from Texas Select Vapor. Though Texas Select Vapor offers a whole variety of products, e-liquid manufacturing has always been a main focus. The company has been growing at a rapid pace from not only its web-store, but also from having the Texas Select Vapor premium e-liquid in more than 20 stores around the world. This comes as to no surprise since the day the company began, it produced high quality e-liquids in an advanced way that few vendors were doing. To get documentation on your product from Texas Select Vapor, find the 8 digit lot number located on the bottle underneath the production date of your product. Enter the lot number in the designated field at the Texas Select Vapor website and click” lookup” to perform the search. 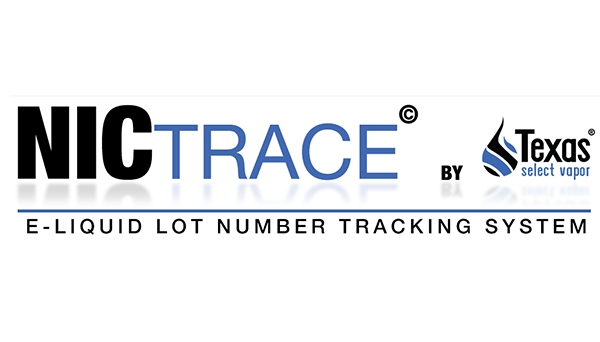 Once your lot numbers are found within the NicTrace© system, your results will be delivered in the form of .pdf files for you to download and view. The system is available to all customers who have purchased directly from Texas Select Vapor or one of its Authorized Retailers. This new “NicTrace” system is a step in the right direction for Texas Select Vapor. Though the company is still considered a small business, they’re producing perks for consumers that would make you think otherwise.